On Friday June 01st 2012 we were at the Scott Township Fire Hall, which is located just outside of New Castle Pennsylvania. The event was a sweet 16 birthday party for Caitlyn Wimer. Caitlyn and her guests began arriving at 7:00 pm where the entered into the completely transformed Scott Township Fire Hall. They did an incredible job at turning the venue into every sixteen year old girl’s fantasy party spot. There was a candy bar, a popcorn station, a cotton candy station, a photo booth, a lounge area, over 600 helium filled balloons and a wide assortment of finger food that were served butler style. 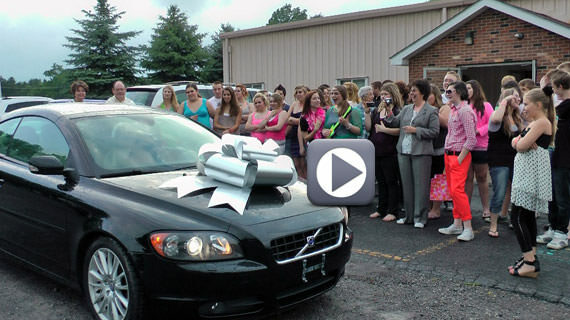 At about 8:00 pm Caitlyn’s father Mr. Richard Wimer welcomed all of the guests and presented Caity with her birthday present – a new Volvo Convertible! Throughout the remainder of the evening everyone danced, posed for pictures in the photo booth and even played a game of walla-balla. The sweet 16 party concluded at 11:00 pm.